How do you run wild? 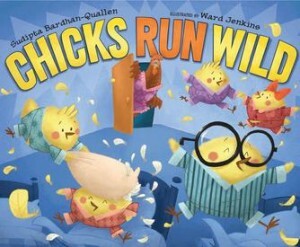 Chicks Run Wild is a hilarious picturebook that will be released January 25, 2011 by Simon and Schuster. The pictures are by Ward Jenkins and the story by Sudipta Bardhan-Quallen. The little chicks in CHICKS RUN WILD certainly think they know how to go wild – until Mama shows them how to really do it! But we want to know … how does your class RUN WILD? Create a photo essay and win! Kids and teachers: check out the Chicks Run Wild Photo Essay Contest. The class with the winning photo essay can win a PRIZE! This entry was posted in children's books, contest and tagged children's books, marketing, Sudipta, traditional publishing. Bookmark the permalink. Post a comment or leave a trackback: Trackback URL.